Here’s a variation on Chickpea Flour Flatbread. Combining Socca, the chickpea flour crepe and the pizza dough bread served with toppings called Foccacia and you have Soccacia! Follow the instructions for the Chickpea Flour Flatbread. While it’s in the oven, chop a large onion to about a half inch dice. Heat a heavy duty sauté pan with 1 tablespoon of olive oil until the oil is shimmering like water but not smokey. Onions may also be dry sautéed without oil, using a tablespoon of water as necessary to prevent sticking. Add the onion and sauté for about 15 minutes over medium heat or until it browns and caramelizes but does not burn, stir occasionally. 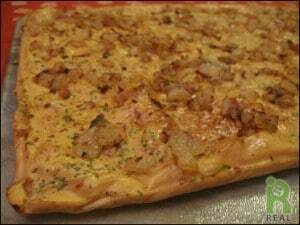 During the last five minutes of the flat bread’s baking time remove it from the oven and spread the onions evenly over the top. Return to the oven and bake for the remaining 5 minutes.